I am investigating the different ways that we think of variables. I expect there to be six different ways given by pairs of four levels. How do variables express infinity, one, zero? How do variables come up in defining finite fields? Relate the kinds of variables to the kinds of equivalences. Relate the kinds of variables to the kinds of transformations of geometries. Consider variables in computer science. Study Monads in functional programming and category theory. 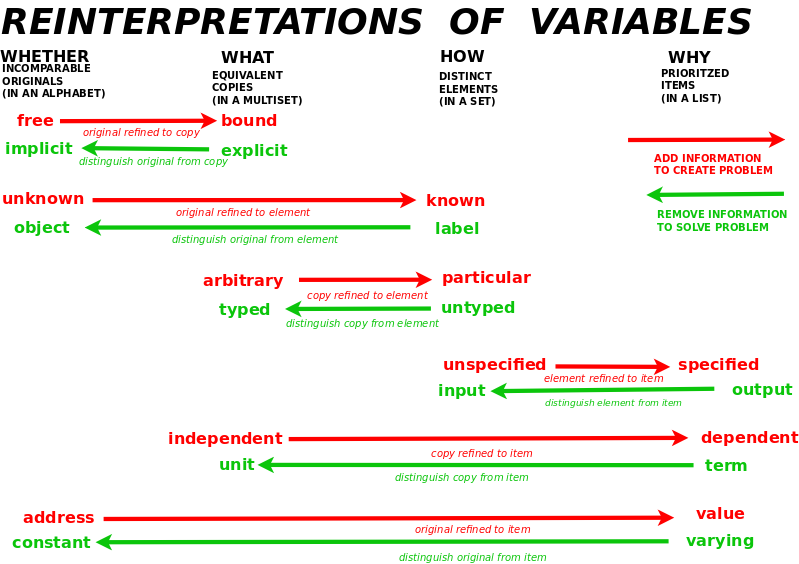 Six types of variables give the ways that visualizations lose information as they restructure. Thus visualizations solve problems. How to make sense of the following? Evolution: Given a hierarchy, a sequence distinguishes originals (implicit) among copies (explicit)(in time). Atlas: Given a network, a hierarchy distinguishes originals (objects) among a set (of labels). Canon: Given a sequence, a network distinguishes copies (of typed) within a set (of untyped). Chronicle: Given a sequence, a hierarchy distinguishes distinct elements (inputs) within a list (outputs). Catalog: Given a tree, a network distinguishes copies (unit) within a list (of terms). Tour: Given a network, a sequence distinguishes originals (constants) from a list (of varying). Each variable represents a potential change in state. I expect there to be four possible states. They are the kinds of signs: thing, icon, index, symbol. Each variable includes a label and a value. They can be variously related. We can organize variable types in terms of explicitness. Those without commitments, not already used by logical expressions. Those not referred to elsewhere. Explicitly a function of another variable, or not. May not be explicitly written, though. The relationship may be in our minds. Reference cell that a spreadsheet formula refers to, where a value is kept or described. An atom for strings, words. The form of the letter or symbol may change slightly, with the font yielding particular connotations or specific meanings, as with math symbols. Indicates our intention, do we intend to solve for it. We solve for an unknown in terms of knowns. Solving a system of linear equations we have unknowns, some or all of which can become knowns. We also have constants. Taken to be an instance, a member a of a well-defined "set" or not. A variable may be declared but only later get assigned a value. Center: self-repeating (activity) - keeps finding a center within the center. Thus it defines a "thought", concept, object, item, etc., that which is self-referential, which sustains attention. Copies: the act of copying determines a tree, for there are first level copies, copies of copies, and so on. List: order a set sequentially, thus a total order upon it. Is, essentially, counting. Equality (of categories) is related to the use of variables (and their meaning). A variable is an "atom" of meaning as in my paper, The Algebra of Copyright, which can be parsed on three different levels, yielding four levels and six pairs of levels. A function Phi may be based on an point in the manifold whereas its coordinates may be based on a particular, explicit, specific chart. See Penrose page 186. Partial derivative - formal (explicit) based on change in variable, total derivative - actual (implicit) based on change in value. 2016.08.22 A: Koks kintamųjų vaidmuo matematikoje ir plačiau? D: Tu žiūrėk, kas pastovu, mąstyk nulybės atvaizdus ir suvoksi, kaip vienas platesnis už kitą, tad keičiasi pati nulybė. O kartu su ja keičiasi viskas, taip kad aš esu visakame, jo laisvume, o tą laisvumą išsako dar du atvaizdai, o jie kartu slypi šiuose keturiuose. Tad tai ir yra pagrindas šešių kintamųjų, tačiau tau tenka juos išsakyti lygmenų poromis. Tad mąstyk kaip visa tai atrodo iš šalies, kaip esu išreiškiamas kiekvienu reiškiniu, kaip jame dalyvauja tiek Aš, tiek Sūnus, tiek Dvasia. O mūsų dalyvavimas tiek iš vidaus, tiek iš lauko sudaro dvi trejybių poras. Tad mąstyk taip ir viskas susives, kaip matai.